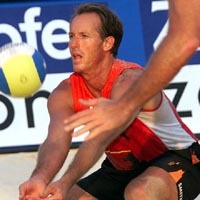 Smith has competed in more beach volleyball events than any other player. He and Carl Henkel tied for fifth at the 1996 Atlanta Olympic Games. Smith played his first pro open in 1977 with beach volleyball legend Ron Von Hagen before winning his first title with Mike Normand the same season. Smith was the second volleyball player to be inducted into UCLA Sports Hall of Fame (1991, Ernie Suwara the first). A former member of the U. S. National team (1979-1982), Smith led UCLA to two National Championships (1976 and 1979) while earning All-American honors. He was the Most Valuable Player in the 1979 championships. His college jersey (#22) was retired March 4, 1992 at UCLA's Pauley Pavilion. Named Christopher St. John Smith, "Sinjin" is the Old English pronunciation of St. John. He has been featured in more than 20 commercials while appearing in several television series, including "Magnum PI." He also starred in Tri-Star Pictures release "Side Out!." He has also authored a book ("Kings Of the Beach") and has a Nintendo Video game under same title. He and his wife (Patty) have three boys.